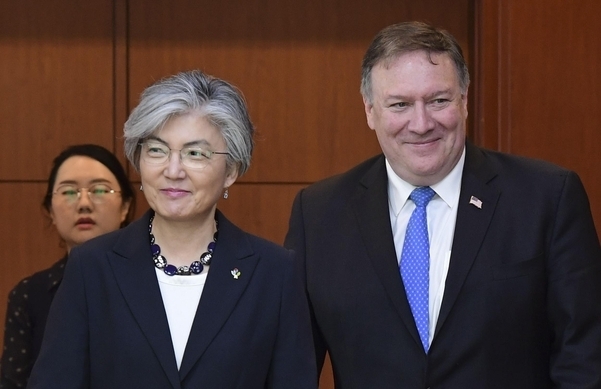 Foreign Minister Kang Kyung-wha and Secretary of State Mike Pompeo discussed the results of the latest high-level talks between Pyongyang and Washington. Kim Yong-chol, a top North Korean envoy, visited Washington DC for negotiations with Pompeo last week. He met with President Donald Trump as well. The US was quick in announcing that Trump's second summit with North Korean leader Kim Jong-un will take place in late February. It did not reveal an exact date and venue amid working-level discussions between the two sides are under way in Sweden. Vietnam is cited as a possible location. Trump reportedly favors the central coastal city of Da Nang, while Kim wants the capital, Hanoi. Kang and Pompeo assessed the North Korean official's trip to the US as "successful" and agreed to cooperate closely on a second Pyongyang-Washington summit so that it will lead to the faithful implementation of the agreement made at the previous one in Singapore on June 12 last year, according to the ministry. The allies had ten rounds of bargaining on the Special Measures Agreement throughout last year but failed to strike an agreement.